232 pages | 15 B/W Illus. In Gaia, Psyche and Deep Ecology: Navigating Climate Change in the Anthropocene, Andrew Fellows uniquely connects Earth systems, Jungian and philosophical approaches to the existential threats that we face today. He elucidates the psychological basis of our dysfunctional relationship with nature, thereby offering a coherent framework for transforming this in our personal and professional lives. Demonstrating the imperative for new ideas that transcend the status quo, Fellows tackles unprecedented 21st century challenges such as climate change through his interdisciplinary approach. Fellows proposes a worldview, informed by depth psychology, which radically contradicts the prevailing shibboleths of unlimited economic growth, dominion over outer nature and negation of our inner nature. To accommodate a broad readership, he first introduces the Anthropocene and sufficient basics of systems dynamics, Gaia theory and analytical psychology before exploring the mind-matter conundrum. He then correlates the structure, dynamics, contents and pathology of Gaia and of psyche, critiques the Western Zeitgeist as midlife crisis and establishes parallels between deep ecology and psychological individuation. 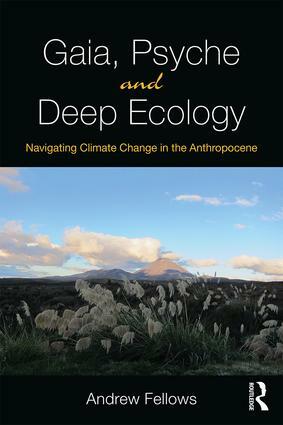 This ground-breaking synthesis of Gaia theory, analytical psychology and deep ecology reveals synergies which show how we can, and why we must, relinquish anthropocentrism in order to survive sustainably as equals in and with the natural world. Combining Jungian theory with other cutting-edge disciplines to inform, inspire and heal, this book is essential reading not only for Jungian analysts, students and scholars, but for all—including professionals in Earth systems science, environmental philosophy and ecopsychology—who realise that ‘business as usual’ is no longer an option. Andrew Fellows is a Jungian analyst with private practices in Zürich and Bern. He holds a Doctorate in Applied Physics, and enjoyed many years of international professional engagement with renewable energy, sustainable development and energy policy.